^ 王青. 鲧禹治水传说新探. 南京师范大学文学院学报. 2003, (03) [2013-07-26]. doi:10.3969/j.issn.1008-9853.2003.03.007. ^ Birdlife soars above Botswana's floodplains 互联网档案馆的存檔，存档日期2011-02-09.. Africa.ipsterraviva.net (2010-10-15). Retrieved on 2012-06-12. ^ Flood Warnings. Environment Agency. 2013-04-30 [2013-06-17]. ^ Australia rainfall and river conditions. Bom.gov.au. [2013-06-17]. ^ AHPS. [29 January 2013]. ^ FFG. [29 January 2013]. 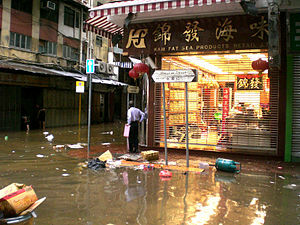 ^ BMT WBM Pty Ltd., Brisbane, Queensland "TUFLOW Flood and Tide Simulation Software" 互联网档案馆的存檔，存档日期2008-06-27. ^ WaterWatch. 4 February 2013 [4 February 2013]. ^ Community Collaborative Rain, Hail and Snow Network. [4 February 2013]. ^ NOHRSC. 2 May 2012 [4 February 2013]. ^ Advanced Hydrologic Prediction System. [4 February 2013].